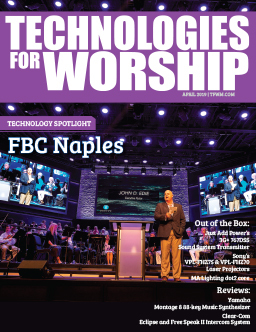 Whether addressing overflowing worship areas, extending their reach to new communities, or launching television ministries, houses of worship are turning to advanced broadcast technologies to deliver the worship message. Video display systems have become widely accepted as a means of enhancing worship and making it more accessible – to ensure that everyone in attendance can see and hear the message, and to provide a more engaging experience for younger generations that have grown up with multimedia messages as a familiar source of information and entertainment. Equipped with IMAG systems or internal video-distribution networks, many congregations already have some of the key tools required to set the stage for live and taped broadcasts. Some have incorporated video in the form of static images, graphics, PowerPoint® presentations, or video playback from tape or DVD. Other congregations are exploring A/V and broadcast technologies for the first time and are looking to make a smart investment that will meet both current and long-term needs. 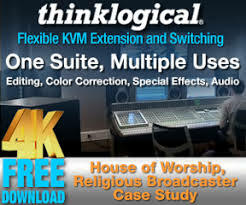 As the cost for professional-grade acquisition and production systems continues to drop, houses of worship that fall into all three categories are realizing that now is a good time to invest in the tools they need to move into broadcasting. It’s easier than ever to create sophisticated live and taped programs for broadcast if the supporting infrastructure has been thoughtfully designed and integrated. Before getting into the technical nitty gritty of A/V planning for live or taped broadcasting, the house of worship must create a game plan and get everyone involved invested in the project. This plan should detail the primary objectives of the installation and address the role of the project in meeting the congregation’s long-term goals for media use. While the project should be led by a small team or committee with a clearly defined mission, key decision-makers across the congregation must be involved in the planning process to the degree that they become and remain committed to its purpose and completion. One way to draw in various decision-makers is to focus on how the new production and broadcast capabilities will extend the reach of the ministry and foster the continued growth of the congregation. Leave the technical jargon out of the conversation and instead emphasize the benefits of implementing new technologies. Key issues to address in this planning phase would include how the system will be used and what the anticipated end product will be; what the quality and format of video and audio will need to be; and where and how the video will be broadcast and otherwise distributed, both immediately and in the long run. By accounting for these considerations up front and creating a forward-looking plan, the house of worship can minimize surprises and unexpected costs down the road. These factors are important for equipment-planning purposes and in determining the overall budget for the project. Taking the conversation outside the congregation and getting input from colleagues and contacts at other houses of worship can be valuable in preventing common problems, as well in making sure no critical factor is overlooked. Likewise, building a relationship with a consultant or systems integrator can facilitate the planning process and help make the most of budgeted dollars. Only a small number of large churches and ministries today provide true “live” broadcasts, since these can present technical, legal (royalties for music, etc. ), and cost challenges. However, an increasing number of churches do produce broadcasts of their services for distribution and viewing the following week. With the exception of particularly timely services, such as those falling on religious holidays, it remains most practical and cost-effective for houses of worship to record services, edit them in post-production, and deliver the result for broadcast – via television and often the Web – and distribution on DVD. In either case, live or taped for broadcast, the process requires many of the same fundamental A/V and production systems. Video production in the main worship area or sanctuary requires cameras, audio and lighting, signal routing and switching systems, editing, titling, and audio sweetening tools, and a means of getting finished programs out the door, whether on DVD or via an uplink or even distribution over the Internet. All of this equipment – and the power, HVAC, and networking systems needed to support them – should be planned out with flowcharts outlining the workflow, as well as in floor plans specifying the actual placement of equipment. In new facility construction, all these factors should be presented to the architect as planning gets under way. As production continues to migrate to HD, the widescreen format is becoming dominant – even for those broadcasters still working with SD video. Costs for HD gear have dropped significantly and, at this point, an investment in HD is the best choice for any organization looking to get years of use out of new broadcast equipment. As a result, preparations for broadcast production must also address the suitability of the stage, pulpit, or presentation area for shooting at a 16:9 aspect ratio. 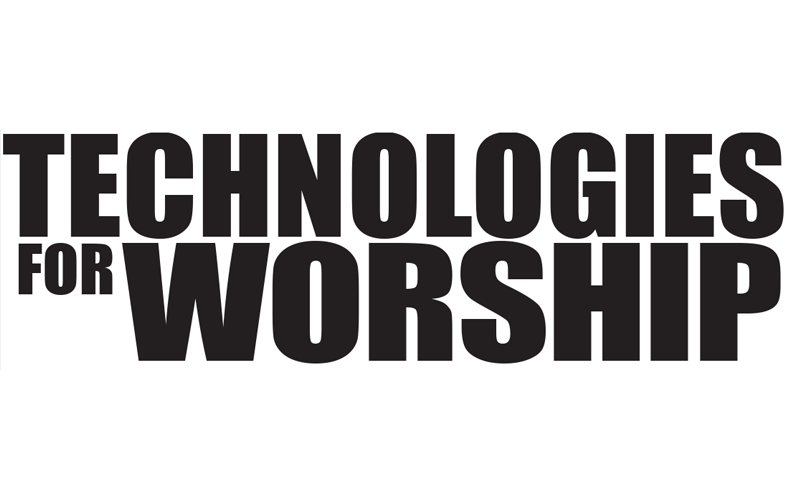 If cameras, lights, and microphones are being added to an existing worship area for the first time in any significant number, care should be taken to minimize the evidence of this equipment and its impact on the atmosphere that’s become so familiar to the congregation. Video is central to broadcasting, and live production generally is a multicamera setup that provides both a main shot and an iso record, typically used for cutaways. If the event is being switched live, multicamera recording enables capture of the close-ups, pans, and other shots that add critical breadth, depth, and detail to the broadcast. For broadcast programs being edited prior to transmission, cutaway shots facilitate seamless edits for the sake of program length and content. The crew achieves the greatest flexibility if there is one iso shot for every main camera. Tally lights supply valuable nonverbal cues to operators and presenters about which camera is recording. Use of a high-quality pan/tilt head will provide added stability and allow less-experienced shooters to get behind the camera. Recording format – SD or HD – is among the most important camera-related decisions, and houses of worship tend either to make the leap to full HD facilities, or to build an HD-ready production system and use SD cameras until their budgets accommodate the upgrade to HD cameras. Both strategies are sound, but this is another instance in which professional guidance can help in identifying the best approach. In choosing between 720p and 1080i, matching the format to the target transmission platform is the best bet when productions are being delivered to a cable operator or broadcaster. While video is central to production, the quality of the broadcast depends a great deal on audio and lighting. Audio is the means by which the message is delivered and music shared with the viewer; it is equally as important as the visual representation of worship. An acoustical engineer can help identify ideal fixture placement, sound baffling, types of surfaces used, and the shapes and location of walls – all with the goal of acquiring a good sound mix including speakers, musicians, and members of the congregation. The production team will need an audio console that can manage the PA and all of these audio feeds, as well as a communications system for successful cooperation in live production. In older buildings, enhanced lighting often will be required to offset the use of dark wood and dim lighting and ensure the broadcast is bright and clear. HD is particularly demanding with respect to lighting, and while the natural light in many churches and temples can add to the experience for those in attendance, it also makes it more difficult for cameras to capture good images. By tailoring lighting to both the recording format and broadcast platform, the house of worship can significantly improve picture quality. Switching systems offer a broad range of capabilities over a broad price range. In the worship environment, some of the most important requirements are that the system be easy enough for volunteers to use, support the appropriate number of inputs, offer sufficient keyers, provide useful integrated functionality such as CG and clip store, supply SD and/or HD flexibility as needed for current and future production, integrate well with other systems, perform reliably, deliver the output type required by the broadcast outlet, and fall within budgetary constraints. Given all the available options, assistance from an integrator can help to simplify this decision. In taking on production for live or delayed broadcast, houses of worship must focus on their goals in providing that programming and on the requirements and preferences of the target broadcast outlet. As leading religious networks make their own transitions to HD, the demand for quality HD content has grown. By addressing key aspects of broadcast production, houses of worship working in HD can step up and meet this demand with programming that reaches out and engages viewers. Furthermore, by making the best use of every element involved in production, the house of worship can put its best foot forward in sharing its message with a wider audience. Achieving this goal demands the participation and support of the congregation, as well as careful and informed planning, system integration, and implementation of the production facility.